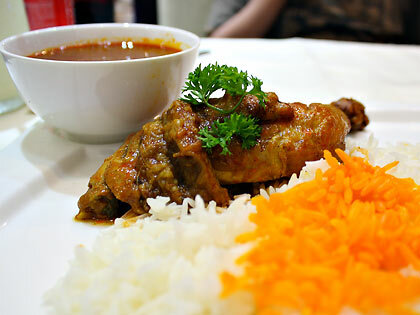 Persian or Iranian food has been around for some time now in the Philippines. Back during our college days we've had a considerable number of Iranian schoolmates. Many dining places have consequently surfaced that cater to Iranians in the country and pretty soon locals themselves were patronizing such restaurants. Some of these restaurants have modified their fare to suit Filipino taste but many others have stayed true to their roots. In our hunt for the latter, we've realized that one of the best ways  as with other international cuisines  is to look for a dining establishment whose owner is Iranian. Better still if the head chef/cook is also Iranian. 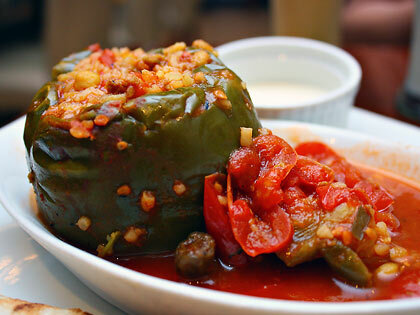 Pepper Dolma or stuffed pepper; dolma is an influence from the Turks. But what is Persian cuisine really? Persian is the old name for Iranian cuisine  Iran was known as Persia until 1934. Persian culture dates to as far back as 2000 BC. Persia has seen different waves of foreign invaders even as the Persians themselves have conquered and ruled over other people since that time. As a result Persian culture and cuisine has been influenced by different people groups such as the Assyrians, Babylonians, Greeks, Romans, Indians, Caucasians and Ottomans (Turks). Curry was adapted from the Indians while the Indians adapted elements of Persian cuisine from the Mughals. Dishes such as kofta and pilau are now common to both Iranians and northern Indians. Dolma (stuffed fruits or vegetables) and kebabs were introduced or reinforced by the Turks or Ottomans. Fast forward to the 21st century in Metro Manila. One of the newest Iranian restaurants in the metropolis is Habib Persian Cuisine located at The Portal area of The Hub Greenfield District (United St. in Mandaluyong). The owner and head chef of Habib are both Iranians so we more or less believed their servings should be authentically Persian. For this story on Iranian cuisine we'll take you briefly through some of the dishes we've encountered here and in some of our previous visits to other Persian dining places in Manila. with pita bread at Habib Persian Cuisine. For appetizers we went with the three-dip Habibs Delight served with warm pita bread. 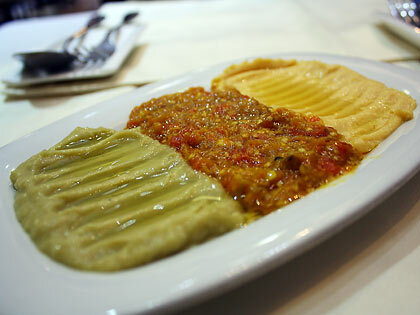 The dips are moutabal, mirza ghaseemi and hummus. Moutabal, also referred to as baba ghanoush, is a dish made up of mashed eggplant that had been broiled over open flame and mixed with flavoring. It has a smoky taste due to the grilled eggplant which we happen to enjoy very much. The mirza ghaseemi is a relative of the moutabal. Like the latter, it is grilled eggplant but also seasoned with garlic, tomato, turmeric, oil or butter, salt, pepper and eggs. Mirza ghaseemi is a very tasty dish; we think that non-eggplant eaters will fall in love with it. Hummus  actually a Middle Eastern dish  is made from mashed chickpeas blended with olive oil, lemon juice, salt, garlic and tahini. The sliced pita bread that came with the three dips is a round, flat bread and is either baked or cooked over a bed of small stones. Mixed chelo kebab consisting of beef and chicken kebab with saffroned and buttered rice. The two dishes above come from different Iranian restaurants in Manila. Although we started our dinner with bread, Iranian cuisine is based mostly on rice. Typical Iranian main dishes consist of rice combined with meat (lamb, beef or chicken) or fish. Our main dishes consisted of plates of rice flavored with saffron and butter. 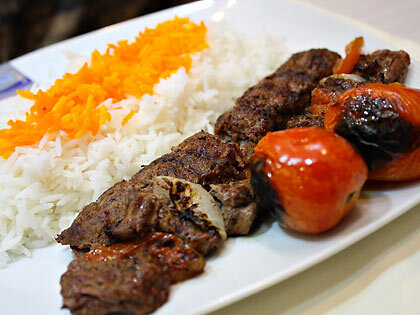 Chelo kebab  the national dish of Iran  is rice served this way with kebab or grilled meat. We ordered two kinds of this: the special chelo kebab beef and mixed chelo kebab. The special chelo kebab beef includes two skewers of beef  one consisting of ground beef and the other of beef tenderloin cubes. The mixed chelo kebab consists of a skewer of ground beef and another of chicken. Kebab meats are all grilled with servings of tomatoes (likewise grilled) on the side. Although chelo kebabs are traditionally served with rice as previously stated we did a twist on the mixed chelo, asking for pita bread instead of rice to accompany the kebab. Iranians actually prepare rice in two ways  as the plain chelo mentioned above and as polo (or pilau) which is also steamed rice but prepared with several ingredients such as potatoes, meat, vegetables, nuts and fruits. The latter can be prepared in various combinations. Habib's jujeh kebab or Persian barbecued chicken. There are of course practically endless varieties possible with kebabs. 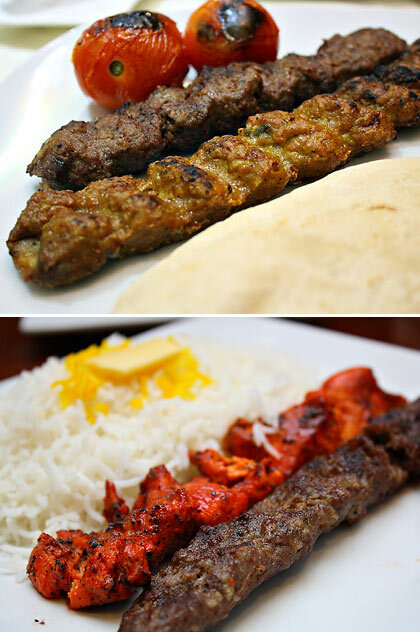 A particular dish at Habib's is worth mentioning though, namely the jujeh kebab or Persian barbecued chicken. 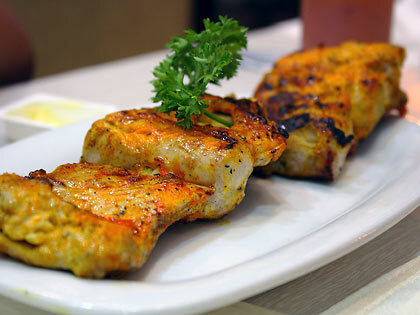 This is chicken marinated in lemon, saffron, yogurt and onion then grilled over hot coals. The result is a juicy and tasty dish. Eggplant is a major element of Persian cuisine as we've discovered from years of dining in Iranian restaurants. In our visit to Habib we also tried out an eggplant stew for the first time: khoresh bademjan. Khoresh is Farsi (the Persian language) for stew while bademjan means eggplant. The Khoresh bademjan we sampled had chicken and eggplants stewed in saffron, onions, turmeric, tomato paste and tomatoes. It is normally eaten with saffroned rice and butter, although we did dip some pita bread into the stew. The stew may not look to be the prettiest of dishes but it was certainly delicious. 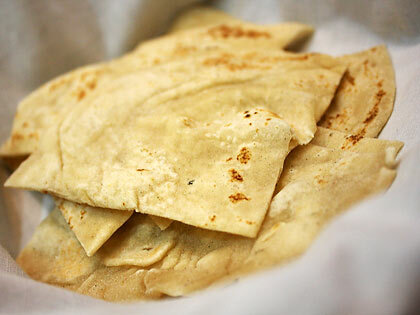 Something we just had to order even with all that chelo or rice being served: pita bread. We've mentioned dolma earlier. Dolma is a generic term for any vegetable of fruit stuffed with a rice and meat mixture. Stuffed grape leaves are perhaps the most popular dolma among Iranians but a dolma we've sampled a few years back consisted of stuffed bell peppers with ground meat, rice and herbs in tomato sauce. Back at Habib's we had our favorite western/southern Asian drink to accompany our small Iranian feast: a yogurt drink sometimes mixed with milk and water called doogh (lassi in Indian). Habib's doogh seems to contain mint which is a typical Iranian practice. Several Iranian restaurants in Manila also offer flavored doogh such as mango. Diners are often given the choice of sweet or salty doogh (or lassi) and we always end up ordering the sweet version. Leo had tried the salty version of lassi years before  in a home meal in Pakistan's Khyber Pakhtunkhwa province. He says he'll stick with the sweet version. We're sure that experiencing Persian cuisine right in Iran would be something to look forward to but even if we never get the chance to do so we can still enjoy Persian dining right in our own country. The numerous Persian dining places here in the Philippines would help ensure that.